Today Amazon announced new Kindles. Three are e-ink devices, like all the Kindles that have come before. Unlike all previous Kindles, none have keyboards. The cheapest is a $79 device with some basic navigation buttons. Then comes the $99 Touch, followed by the $149 Touch 3G, and, finally, the Kindle Fire. The Fire is the most interesting of the bunch. It is a 7″ color tablet with WiFi and a custom version of Android that will sell for $199. Compare that to the Nook Color, another Android based color tablet from a bookseller which goes for $250. Of course, before the announcement, lots of people were yammering about it as a challenger to Apple’s iPad. It’s $300 less than the cheapest iPad, but I don’t think its a good comparison. The iPad has a 10″ screen, which is large enough to support some fairly functional applications, like the Numbers spreadsheet. It’s also large enough to provide a highly usable on-screen keyboard in landscape mode. The Kindle Fire isn’t going to support the same breadth of apps. I think the Kindle Fire is a much closer competitor to the iPod Touch. Like the iPod Touch, the Kindle Fire is strongest as a content consumption device. The larger screen makes it better for reading, for watching video, and for playing games, but it’s also less portable than the Touch, which probably matters most for music and for a lot of games. I think the Fire is bad for pretty much any other Android tablet. No one is having much success going up against Apple head-to-head, so Amazon widely targeted the 7″ form factor (though rumors are that a 10″ is coming). I think they’ll do much better here than any other Android tablet since they provide a strong distribution channel and it seems they are willing to sell at or below cost in exchange for all the commerce opportunities that will come once people have the device. It’s interesting to compare Amazon to Apple’s approaches to this general market. Both companies sell hardware and have electronic storefronts people can use to buy content and games for the hardware. Apple sells the content with thin margins to enhance the value of their high-margin hardware. Amazon sells the hardware with thin or negative margins to enhance the volume of low-margin content they sell. There have been a lot of complaints about Apple’s desire to get a cut of in-app content sales, but, never the less, iPad users aren’t limited to content distributed through the App store. For example, even though Apple distributes TV shows, movies, and ebooks, users can get video content from Netflix and Hulu, eBooks from Barnes & Nobel, Amazon, and others. Will Amazon be as open? One thing is clear, this is a blow to Google’s influence over Android in the tablet market. It weakens other Android-based tablets while the whole Android identity take’s a backseat to Amazon’s Kindle brand. This entry was posted in General on September 28, 2011 by eas. I still need to explain what I think some of the facts I laid out earlier surrounding Windows 8 could mean, but before I do, I feel like I should share my thoughts on the implications of some of the under-appreciated synergies between OS X Lion, iCloud and iOS 5. I’ve been chewing on this for a while, but I was finally inspired to post something after commenting on Amit Kumar’s post “The User Experience of Apple’s Upcoming iCloudBook.” In that post, Amit builds on an earlier blog post where he explains how he thinks certain features of OS X Lion portend a “cloud” notebook from Apple. Its some nice thinking, but I think its fundamentally flawed. The reason? By focusing on Lion and the Mac, he’s thinking about Apple too narrowly. That focus might have made sense just a couple of years ago, but these days it’s important to remember that Apple earns substantially more revenue, and profit, from iOS devices than the Mac. The real story, in my view, is how Lion’s new document model and incremental file versioning and storage, along with iCloud and iOS 5 combine to create the beginning of a seamless, pervasive computing environment. I’ve linked above to an in depth discussion of Lion’s new document model and the file versioning and storage services that support it, but to put it briefly, apps built specifically for Lion are supposed to continually service changes to disk, while the file versioning and storage services help support compact storage of multiple versions of the same file and provide a standard way for users to access older versions. The key here though is the fact that the version on disk is never very far out of date, and that the changes are stored in a compact manner. Now add iCloud, and this means that as long as some Internet connectivity is available, a user can have an up to date version of their documents available from anywhere, including their iPhone, or iPad. You stay late at the office to finish a presentation you have to give in Denver tomorrow afternoon. You put the finishing touches on the presentation with Keynote, close your MacBook Pro, and hurry out the door so you aren’t late for your girlfriend’s birthday dinner. The next morning, in the line for a latte at an Airport Starbucks, you pull out your iPhone, and open Keynote so you can review the presentation. Your laptop is still closed, on your desk at work, but the latest version of the presentation opens quickly from iCloud. You flip through the presentation until your order is filled. As you wait to board your flight, you sip your coffee and fix a few typos. A little later, you fasten your seatbelt and pull out your iPad. While you wait for the flight to depart, you open Keynote, and make further changes to your presentation. As you move from device to device, the latest version of your document is available to you without a second thought. It just works. This entry was posted in General on September 18, 2011 by eas. I haven’t spent a lot of time looking at demos of Windows 8, but I have been reading and listening to thoughtful commentary by Horace Dediu and John Gruber, which has, in turn, got me thinking. This post is an attempt to work through some of those thoughts, but, where to start? Windows 8 won’t ship for a year or so. Microsoft demoed Windows 8 on an Intel i5 based tablet that is so beefy that it needs a cooling fan, and which, by implication, must have some combination of poor battery life and added weight and bulk to support the larger battery. They also demoed Windows 8 on ARM based tablets running the soon to be released NVidia Tegra3. This platform, or it’s successor, will likely not perform as well as the i5 based tablets, but should offer better battery life for a given level of performance. In theory, the power/performance will be in the range of whatever Apple puts in the iPad3, but hardware is only part of the story. The iPad’s apps and OS are built for the power and performance constraints of a mobile device. Windows 8 is schizoid. On Intel, it will run traditional Windows apps within the context of a slight evolution on the traditional windows API and new Metro apps. Metro apps will be distributed through a Windows App Marketplace, and microsoft will take a 30% cut of revenue. A corrolary of Moore’s law, dubbed Koomey’s Law, states that power efficiency of computation doubles approximately every 18 months. Battery technology improves much more slowly. Capacity of lithium ion batteries is improving at a rate of less than 10% per year. These numbers don’t quite square up, but they support something I read when the first iPad was released, that the large display was the biggest contributor to the devices power consumption. Micrsoft’s enterprise customers are slow to upgrade. Many were on Windows 2000 or XP (and IE6) and only just recently upgraded to Windows 7, which helps explain why Windows 7 has sold so well, but also suggests that they will not be in a hurry to upgrade to Windows 8, indeed, they may not upgrade again until Windows 10. Apple has been winning new enterprise customers with the iPad. Well, that took longer than I thought. What I actually think it all might mean is going to have to wait for a follow-up post. This entry was posted in General on September 17, 2011 by eas. A friend posted a link to an early 3D animation by Ed Catmull (co/founder of Pixar), and Fredrick Parke from 1972. The footage was digitized and posted earlier this year by Robby Ingebretsen, whose father was a grad student at the University of Utah along with Catmull and Parke. He gives more background on his blog. I did a little digging to try and find information on the “kit” used to produce this footage. 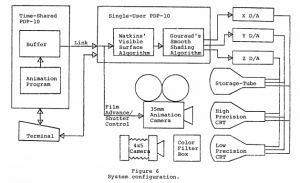 Catmull published “A System for Creating Computer Generated Movies,” in the 1972 Proceedings of the ACM that seems to cover this work. It was surprisingly difficult to find a copy of the paper available without traversing a paywall, but I did find it on dockstock. By the time the paper was written, the idea that a computer was a general purpose computational device seems well enshrined, because there are pretty much no specifics on the hardware. This system uses two PDP-10 computers. One of these is a dedicated machine that allows only one user at any given time. This processor is interfaced to the special equipment needed to produce half-tone pictures. The other PDP-10 is time-shared, and runs under the TENEX operating system . There is a link between the machines that allows data to be transfered between them . This system allows us to take advantage of the TENEX operating system, particularly the file system, on one machine and the special half-tone display equipment on the other machine. According to the paper, it took about 2.5 minutes to render out an individual B&W frame of the facial animation. That’s on hardware that was probably in the ballpark of $400,000 in 1972 dollars. I grew up in Salt Lake City in the 70s and 80s and I was crazy about computer graphics. I knew about Evans & Sutherland, a pioneering computer graphics company founded by two faculty members at the University of Utah (I was in heaven when I got a tour and a demo of their systems in the early 80s), but it wasn’t until I was much older that I realized what an important place the U of U was in the early days of computer graphics. A look through some of the earliest PhD students of their School of Computing casts some light. John Warnock, Ed Catmull, Henri Gourard, Bui Tuong Phong, James Clark… And then there is the famed Utah Teapot! Warnock, Catmull and others shared some memories of those days in a 1994 session at the Silicon Valley SIGGRAPH chapter. This entry was posted in General and tagged catmull, graphics, pixar on September 3, 2011 by eas.